Wo! Our “rumor” report from last summer has finally come to pass. Although this was expected much earlier in the year, select waves of figures from th failed Walmart exclusive The Black Series [Phase III] 3.75″ super-articulated line has finally become avaialble to online retailers. Orders were solicited mnths and months ago for these figures by online retailers, but their orders were never cancelled (the last we heard). Now, Entertainment Earth has put the final wave of figures up for pre-order on their site. Special thanks to JTA reader Agusin for the alert! We are finishing up the wave 1 basic figure Visual Guides from Star Wars [Solo]. Click below to check out Luke Skywalker (Jedi Master). Make sure to also check out our full review of this repacked figure right here. It’s Luke Skywalker (Jedi Master) again! Yeah, we don’t get it either. Find out why we’re surprised to see this figure again in our Research Droids Reviews today! Be sure to leave your thoughts in our comments section, vote in the poll or even comment about it on our Facebook page. Click the banner below for the direct link to the review! As always, you can also send your review requests via email if you’d like to see something that we didn’t cover yet. Let’s take a look at another sixth scale figure from Hot Toys. Click below to check out the Visual Guide for Luke Skywalker from The Force Awakens. Make sure to also stop by and read our full review of this figure right here. It’s time to check out Hot Toys’ Luke Skywalker [TFA] one-sixth scale figure. See what we think of him in our Research Droids Reviews today! Be sure to leave your thoughts in our comments section, vote in the poll or even comment about it on our Facebook page. Click the banner below for the direct link to the review! As always, you can also send your review requests via email if you’d like to see something that we didn’t cover yet. Hasbro Toy Shop's eBay Stores Adds More: This Time An SDCC Exclusive! Wow! 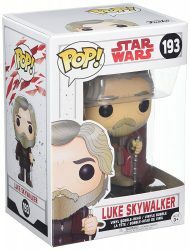 Hasbro Toy Shop has updated their eBay store and they’ve even added a San Diego Comic Con exclusive: the Rey (Jedi Training)/Luke Skywalker (Jedi Master) set to their online store.. Shocking! Special thanks to friend and JTA reader Steve U. for the news! Another Luke, Rey and Rose. Ugh. Sets like this make us SO MAD! Check out the boring Luke Skywalker (Jedi Master)/Rey (Jedi Training)/Resistance Tech Rose/First Order Stormtrooper Officer Kohls exclusive four-pack in our Research Droids Reviews today! Be sure to leave your own thoughts in our comments section, vote in the poll or even leave comments about it on our Facebook page. Click the banner below for the direct link to the review! As always, you can also send your own personal review requests via email if you’d like to see something that we didn’t cover yet. 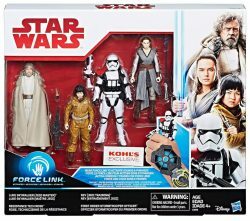 Kohl’s has their exclusive Star Wars [The Last Jedi] 4-pk available online for 20% off. Click here for the product page. Thanks to JTA reader Mike for the alert! We are adding the repacked The Black Series [Phase III] Luke Skywalker (Jedi Master) (46) to our Visual Guides tonight. Click below to check out our guide page, and click here to check out the full review. Repacks are inevitable. Let’s check out the Luke Skywalker (Jedi Master) repack in the 6″ line. Check him out in our Research Droids Reviews today! Be sure to leave your own thoughts in our comments section, vote in the poll or even leave comments about it on our Facebook page. Click the banner below for the direct link to the review! As always, you can also send your own personal review requests via email if you’d like to see something that we didn’t cover yet. Funko revealed two near exclusive Pop! Four packs for Costco. 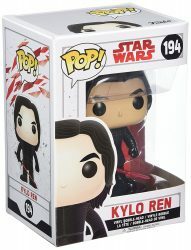 The first is called “First Order Four Pack” and includes Kylo Ren with Glow In the Dark Lightsaber, Supreme Leader Snoke, First Order Executioner, and BB-9E. The second is called “Rebel Four Pack” and includes Rey with Glow in the Dark Lightsaber, Luke Skywalker, Chewbacca (with his Porg Pal), and BB-8. Each Pop! is individually packaged within the four-pack box. It’s hard to justify buying a four-pack of Pop! figures most collectors have just because of a slight change (says the guy with every FO Snowtrooper “Variant”), but where have we heard something crazy like that before?? If you’re a die-hard Pop! collector or you haven’t gotten these individually yet, you just might have to pick this up. They do look nice in that four-pack box, but I didn’t even know Costco still existed! 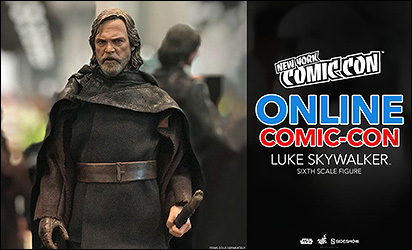 Sideshow previews another Hot Toys Sixth Scale figure, this time Luke Skywalker. Check out this awesome version of the Jedi Master right here! Now it’s time to look at the latest wave of The Black Series [Phase III] figures. Up first is Luke Skywalker (Jedi Master). Click below to visit our Visual Guide page, and click here for a look at our detailed review page. Let’s continue a months-long look at new products from the Force Friday II product launch. Next up is the sadly disappointing Luke Skywalker (Jedi Master) super-articulated figure. Find out more in our Research Droids Reviews today! Be sure to leave your own thoughts in our comments section, vote in the poll or even leave comments about it on our Facebook page. Click the banner below for the direct link to the review! As always, you can also send your own personal review requests via email if you’d like to see something that we didn’t cover yet. We have our first entry in our Star Wars [The Last Jedi] Visual Guide! Click below to have a look at Luke Skywalker (Jedi Master). Make sure to also jump over to our review if you haven’t already seen it. ← What's The Deal With That New Star Wars [The Last Jedi] Obi-Wan Kenobi? Back in January we “teased” an exclusive rumor that focused around a wave of Walmart exclusive The Black Series [Phase III] 3.75″ figures. The lineup ended up changing a bit, although we’re now inclined to believe the female X-wing pilot from Episode VII was confused for Rose. 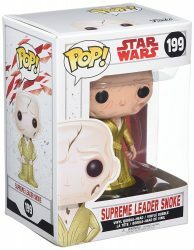 Snoke was bumped out of many initial assortments for reasons still unknown, but we imagine he is still planned for The Vintage Collection. And of course we didn’t know what the “new” Royal Guards were going to look like until the new production images leaked. Now thanks to another source of ours we’re able to provide you with a first look at this final wave of The Black Series [Phase III] 3.75″ figures (which are technically Walmart exclusives at this very moment) but should be available everywhere online soon! Slated with a November street date, you can check out these four super-articulated 3.75″ action figure RIGHT NOW! ← Walmart Exclusive First Order Special Forces TIE Fighter Up For Order! Let’s continue a months-long look at new products from the Force Friday II product launch. Next up is Luke Skywalker (Jedi Master) from the Star Wars [The Last Jedi] line Find out more in our Research Droids Reviews today! Be sure to leave your own thoughts in our comments section, vote in the poll or even leave comments about it on our Facebook page. Click the banner below for the direct link to the review! As always, you can also send your own personal review requests via email if you’d like to see something that we didn’t cover yet. SDCC Exclusive Rey (Jedi Training)/Luke Skywalker (Jedi Master) IN STOCK! If you still need the Rey (Jedi Training)/Luke Skywalker (Jedi Master) SDCC exclusive it’s currently in stock! We’re adding another exclusive to our The Black Series [Phase III] Visual Guide tonight. Click below to check out the Rey (Jedi Training)/Luke Skywalker (Jedi Master) SDCC set. Make sure to also stop by and check out our full review of this set. We don’t think you’re going to find the SDCC exclusive Rey (Jedi Training)/Luke Skywalker (Jedi Master) two-pack as ideal as you may have hoped. It has many things going for it, but does it ultimately fall short? Find out more in our Research Droids Reviews today. Be sure to leave your own thoughts in our comments section, vote in the poll or even leave comments about it on our Facebook page. Click the banner below for the direct link to the review! As always, you can also send your own personal review requests via email if you’d like to see something that we didn’t cover yet. ← Rumor Report: Device App To Help Collectors Find Stuff On Force Friday II? SDCC Exclusives On Hasbro Toy Shop September 1st Now? Well, according to a Customer Service exchange between Hasbro and a member of the SWBS6 Club: Star Wars Black Series 6″ Collectors Facebook group, SDCC exclusives will be available on September 1st (Force Friday II), with a caveat that this date could change. I guess these WON’T be available at HASCON this year. The delay of this date just makes little sense. ← SDCC Exclusives Being Delayed For Hasbro Toy Shop? Can You Wait Until September For Your SDCC Exclusives? Well, now that we know we ain’t seeing these SDCC exclusives any time soon, we’re sure some of you are going to resort to eBay. The prices have come down some, but it probably won’t last once this word of the delay gets out. See if something strikes your fancy (and budget). X-34 Landspeeder And Luke Skywalker, Rey (Jedi Training)/Luke Skywalker (Jedi Master) and Grand Admiral Thrawn await you. ← Sideshow Collectibles Reveals Animated Boba Fett 1:6 Scale By Hot Toys! Hasbro Toy Shop Lists All Three TBS6 SDCC Exclusives! Hasbro Toy Shop has LISTED (they’re NOT available to buy) all three SDCC TBS6 exclusives on their websote. Special thanks to JTA reader Christopher H. for the news! ← Sneaky D23 Elite Die Cast Exclusive! Hasbro’s own OFFICIAL SITE has added the Rey (Jedi Training)/Luke Skywalker (Jedi Master) 6″ SDCC exclusive two-pack to their product pages. It has an MSRP of $49.99 and an order date of August 14, 2017. If Hasbro gets upset at this post my head will honestly explode. See the proof for yourself HERE. And click through for a detailed description. Special thanks to JTA reader Marcel for the alert to this product page! I am speechless. I am without speech. Because of this, just click through and see incredible madness for yourself.